Blonde hair. Fair Skin. Blue eyes. Sounds just like the “Ideal” so often associated with the stereotype of a Perfect Person. It has often been a popular image associated with the country of Germany. Nice little German girl? I am sure she was. Born in Germany? Not quite. But she was born, 90 years ago on April 3, 1924, in a highly-concentrated German section of Cincinnati, Ohio. Ideal? Maybe so. Perfect person? Undoubtedly...and for an awfully long time. Of course I am talking about the lovely lady celebrating her 90th birthday this year, 90 years in which she provided sunshine for all those in contact with her. 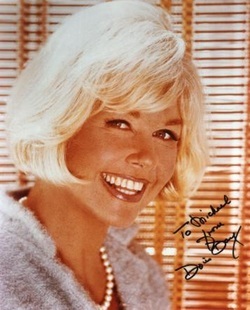 Not sure about you, but when I think of the happy color Yellow, Doris Day is the first one to come to mind. During her formative years, Doris was a tomboy (we know that because she told us many times). That aside, she was a constant joy to her mother. She was a happy girl. She was a devoted sister to her brother Paul. She was popular in school. Happy children usually are, and Doris was no exception. As a child, Doris was athletic…so much so that her mother provided her with the opportunity to take dancing lessons. And she was good. So good, in fact, that she got a dancing partner (Jerry Doherty), and they won all kinds of dancing contests, especially that big one (a $500 prize…big money in those days) that almost gave them a contract in Hollywood to become featured film dancers with the Franchon and Marco Dance Company. She was just 13. They were on the way to Hollywood, but the night before they were supposed to leave, a train accident caused a change of plans. When the train hit the car in which Doris and her friends were driving, Doris sustained a double compound fracture and was told she would never dance again. In fact, it would take several years before she could walk properly again. She did not sit around and mope. Doris was an advocate of that philosophy that says, ”when a door is closed, just open a window”. And she followed that all of her life. She was born to be an entertainer, to bring sunshine to other’s lives. If it could not be with dancing, then it would be with singing. While recovering from her accident, she would listen to and sing along with her favorite singer on the radio, Ella Fitzgerald. She began to learn about phrasing there. But that was just the beginning. Mother Alma got her singing lessons with Grace Raine. Her teacher said she was really good and threw in extra lessons for free. It was Miss Raine who got her a job singing for next to nothing on a local radio show on radio station WLW, where her voice spread sunshine over the local radio. That led to a singing gig with Barney Rapp and his Orchestra (the man who changed her last name from Kappelhoff to Day saying “it would look better on a marquee”.) Doris thought it sounded like a name for a burlesque star, but she went along with it, and it stuck. It wasn’t long after that she started to sing as a vocalist with the Bob Crosby Band. And then it was time for Les Brown and his Band of Renown. She was 16 (Brown thought she was 18.) She needed to lie about her age in order to become a paid performer. It was a lie that stuck because many biographers today confuse her age because of the two year difference. People who saw her perform back then say she made them smile. She had such a happy face, and she sang the songs just to them, a lesson strictly imparted by her vocal coach. I was one of those people as a young kid who saw her perform. I have never forgotten. In fact, I wrote a book about it! Her first stint with the Brown aggregation lasted only about a year. She was beginning to catch on. She was becoming popular. People were coming to see the band, often just to see her. But Doris fell in love with trombonist Al Jorden. She left the band to marry him: “All I ever wanted to do was be married, raise children and keep a clean house”, Doris said. It didn’t last. Jorden was jealous and abusive. She feared for her baby’s life. When Terry was born, she left Jorden and went home to Momma. In order to make enough money to help support her son and pay her share, she took a job on the radio in Cincinnati. Les Brown heard her on the radio, called and asked her to come back. She was reluctant to leave her son, but Momma stepped in and encouraged Doris to do it. She did. The sunny smile began to spread. The rest is history. Doris had decided to go back to Cincinnati to her Mother and son, but while she was in LA, she reluctantly attended a party with her agent and was encouraged to sing a song. That performance led to a screen test at Warner Brothers with Director Michael Curtiz (of “Casablanca” fame). He said as soon as he saw the test, it was a foregone conclusion. She lit up the screen, and a singer began a career as an actress in films---a career unsurpassed by any other female movie performer since. From “Romance on the High Seas” (her first) for 20 years and umpteen pictures, Doris brought sunshine and joy to the movie world. 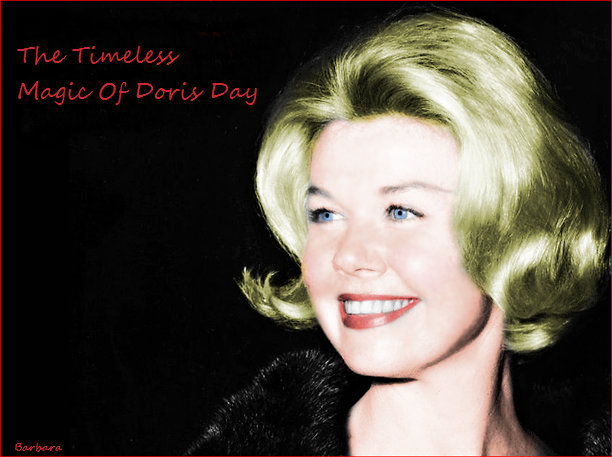 Warner Bros was known at the time for its “Sunny Doris Day Musicals”. And so, Doris remained in Hollywood. Les Brown was then doing orchestral backing for the Bob Hope Radio Show. He was instrumental in getting Doris to join Hope on the weekly show, and she became a regular (entertaining troops and doing sometimes scary flights to visit them, causing her fear of flying today). By the end of 1947, Doris was making her first movie. She was appearing with Bob Hope on the radio. She was also making guest appearances on various other shows, with people like Al Jolson. She had her first hit record with “Papa Won’t You Dance With Me”. She then joined Frank Sinatra on YOUR HIT PARADE and became a co-host on the show that featured the top songs in the country every week. She was 23. One year later, “Romance” was released. It became one of the most popular movies of the year not only in the U.S. but abroad. In the UK, they changed the name to reflect Doris’ #1 Hit Record from the film, “It’s Magic”. On the record scene, that was not all. With Buddy Clark, a combination of “Love Somebody” and “Confess” brought her the first of many Gold Records. In 1948 alone, Doris had 7 Top Ten Record Hits. The sunshine was spreading…from the bandstand, to the radio, on records and on the screen. Everyone said Doris is “infectious”, in a good way. They liked everything about her, especially her bubbly personality. Her first few films, especially those with Gordon MacRae (with whom she appeared the most number of times), helped to solidify the sunshine supergirl, who soon became the most famous “girl next door”. Everyone was in love with Doris, including her directors, her costars, the folks behind the scenes, and of course, her fans here and abroad (she had a huge fan base in England and still has.) Along the way, Doris somehow discovered her dancing shoes once again and did some high stepping with Gene Nelson in several films, always with a bright smile on her face. Some of that high stepping was unbelievable…check out the finale in LULLABY OF BROADWAY. By 1954, Doris signed the first million dollar contract for a female artist with any record company (Columbia); her record, sheet music and jukebox sales garnered her the title of Most Popular Female Singing Artist of the 50’s. Couple that with another career pinnacle: Queen of the American Jukebox. More than one poll of disc jockey favorites placed her in the top spot. By 1955, on the record scene, Doris had reached something of a highpoint: she had the #1 album seller of the year (“Love Me or Leave Me”), and it is still on the list as one of the longest chart runs for an album by a female artist. Then, came a double nomination the next year at the 1956 Academy Awards (“Que Sera, Sera”>the winner and “Julie” both nominated for song of the year). Before that, she had another of the biggest songs in her career, and her favorite…the Grammy Winner “Secret Love”. It ,too, won an Oscar, even though Doris never did. Didn’t matter. Miss Sunshine still claims the prize as the most popular female star in films of all time, supported by box office grosses. I guess the Academy is too ashamed for waiting so long, unlike the Grammy Organization which finally honored her long after the fact. The only folks saddened by the lack of an Oscar for Doris are her fans, who think she deserves her due. Nothing like that would put Dodo in despair. She has often said, “ I had a job, and I gave 100 percent. I did my work to the best of my ability”, and thousands of fans and fellow performers agree. To her credit, numerous prestigious awards were offered at later dates, including: “The Cecil B. DeMille Award” for her body of acting, the “Legend Award” from the Society of Singers , and the Los Angeles Film Critics Award for her contributions to the world of entertainment. Even the President of the US came through with the Medal of Freedom honoring not only her work in entertainment but her work in humanitarian causes. Back to the fifties, and the sunlight continued to spread for the world by 1959 when Doris appeared in the film, PILLOW TALK, and she received her first Oscar Nomination (rare for a comedy performance). Many Oscar caliber performances were to follow, especially: THE MAN WHO KNEW TOO MUCH, TEACHER’S PET and MIDNIGHT LACE. The world discovered that Doris could do almost anything and do it well (and happily). Her work with Rock Hudson (in 3 films) helped to garner them the accolade as one of the most romantic comedy team in movies. (Those on the set of those films still talk about how much fun the two of them had working together and of hearing Doris and Rock laugh, making the entire experience a happy one for everyone.) She got the nod again for her work with James Garner, the most convincing married couple on the screen. By 1968, another facet of entertainment came into play when Doris had a five year run with “The Doris Day Show”. And thus, Miss Sunshine brightened the little screen as well. How about television specials? Yep, two of them, and both highly rated. But in 1974 or thereabouts, the world at large thought Doris jumped ship and disappeared. Such was not the case. She actually never retired. She says, “I just decided to do something else”. That, of course, became her humanitarian work with animals, now in its 35th year. 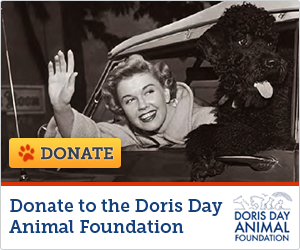 Her organizations include “The Doris Day Animal Foundation” and the “Doris Day Animal League”, much of which is also part of the Humane Society of the US. Her earlier starts were with organizations such as “Actors and Others for Animals”, where she worked with and appeared with many others in public benefits to make the world a safer place for the "four leggers". In 1974, Doris joined host Frank Sinatra on television for the American Film Institute (AFI) ceremony to honor James Cagney, where she gave a moving speech and a clip from the 1955 film Love Me or Leave Me was shown with Doris singing “You Made Me Love You”. Also in 1974, Doris was quietly telling her personal story to A.E. Hotchner in a biographical book which became a best seller on its release in December, 1975. When the book was published, fans were treated once again to that wonderful sunshine lady when she appeared on numerous TV shows to publicize the best seller, including sn appearance on The Johnny Carson Show in January, 1976. She gave interviews as well to folks as far apart in temperament as Merv Griffin, Mike Douglas, Phil Donahue and Barbara Walters. For the next few years, Doris could be seen all over the place signing autographs and giving smiles for the camera at benefits and events to aid animal welfare, her biggest love. In 1985-86, Doris was back on TV, this time for a weekly talk show called “Doris Day’s Best Friends”. She did it primarily as another way to garner funds for the animals, but it was also a chance for Doris to bring back some of her two-legged friends like Les Brown and Rock Hudson. The show with Rock Hudson was one of the most watched interviews of the year…the first time that folks realized that Rock was not so well (he was dying of AIDS). Doris wanted Rock to come to her ranch so that she could nurse him back to health. In 1989, Terry (Doris’ son) escorted her to L.A. to pick up her Cecil B. DeMille Award, presented to her by Clint Eastwood. A few years later, in the early 90’s, Doris surfaced on television once again when Vicki Lawrence took her talk show to Carmel for a day with Doris at another benefit for animals. She may have looked a few years older, but that svelte figure was still there, along with that wonderful smile. From the early 90’s to the present time, Doris has still made herself available from Carmel for numerous interviews, primarily on radio shows, most recently in July 2013 on Sirius XM with Nancy Sinatra. In early 2011, Doris surprised her fans and the music world in general with the release of a new album, containing mostly songs that she sang on the “Best Friends” show that had never been released. They were remixed with some current background music, and Doris hit the charts once again, both in the UK and the US, the only singer to ever do so at her age. Then in 2012, two more CD compilations were released, and these two also rode the best selling music charts. The last release, also in 2012, was one that supposedly contains ALL of the songs she ever recorded for the holiday season: it is called The Complete Christmas Collection. Still more CD releases were planned for her 90th Birthday Celebration. She remains one of the few stars of her era who still receives an overwhelming amount of daily fan mail, a problem for Doris who is experiencing a touch of arthritis, especially in her hands. The problem for Doris is keeping up with it. Believe it or not, she still answers every single piece of mail…not always immediately, but in due time. She has said that if people care enough to write to her, she feels the least she can do is respond. That and daily care for her animals keep her hopping, along with her co-ownership of The Cypress Inn, a pet friendly hotel in Carmel, California. Doris lives atop the golf course in Carmel today and is often seen on her balcony as she waves to the golfers below. When long time fan Carol Johnson went to visit Doris two years ago (she has been several times), she said the thing that stands out most about Doris is her smile…the smile that lights up the sky. It did 90 years ago, and it still does. On the Walk of Fame in Hollywood, Doris has two stars: one for recording and one for movies (they must have forgotten the TV!). Not far away from there, at the TCL Chinese Theatre (formerly Grauman's Chinese Theatre, and Mann's Chinese Theatre) are Doris’ hand and footprints. What’s missing? You got it…that wonderful smile. Special Thanks to Barbara Norton for her efforts on the picture displayed above.